As the Abu Dhabi race unfolded the worst possible case scenario for Mercedes unraveled, a reliability issue. Fortunately for the Lewis Hamilton fans it happened to Nico instead, and although the title was already slipping through his fingers, owing to Lewis' much better start, it prevented him taking the fight to his team mate. What was immediately apparent to me, watching the feed was that Rosberg had suffered an MGU-K failure, in a similar fashion to the problem that surfaced for both drivers in Montreal. As the feed cut onboard to a replay of Rosberg it was apparent that he was shifting the brake balance forward more than usual (62.0 which is the % at which the balance is set at, ie 62/38 forward/rearward), followed by a lock up into the next section and a handful of time lost in relation to Hamilton. 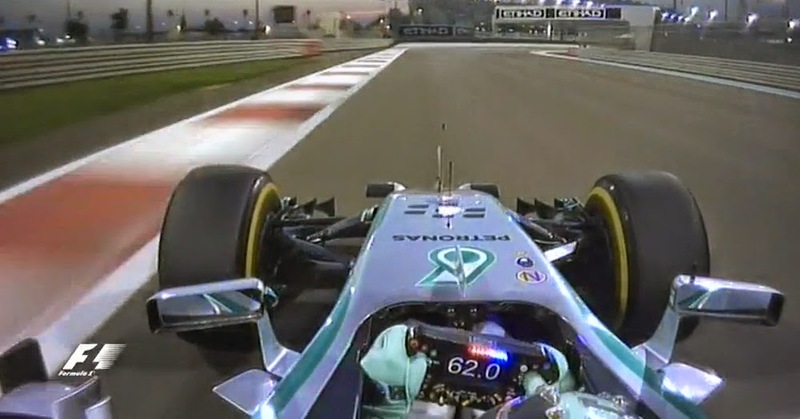 As we can see from the onboard during qualifying, he set the car at his usual 59.0 to enter that section of the track. The reason this is important and why I noted it straight away is that brake balance adjustment is now done by the brake by wire system rather than the mechanical version previously used. This is because the MGU-K harvests significantly more power in 2014 than its KERS counterpart used to, meaning that coming out of the throttle effectively means the car is already braking, owing to the MGU-K recovering energy. The brake-by-wire system checks the brake bias input the driver has selected, how much harvesting the K is doing and then calculates how much force the driver is applying to the brake to equate the two, applying the necessary brake input front-to-rear. Owing to the reduction in braking force needed at the rear of the car because of the MGU-K's additional work the teams have reduced the size of the rear brakes. The 6 piston calipers and larger diameter brake discs previously used are reduced to 4 piston calipers and a smaller diameter disc, as there is no need to carry the additional weight or be penalized for the drag incurred by running larger cooling ducts etc. One of the problems therefore in not having an operational MGU-K is that it causes a balance shift for the driver to deal with, as the car will feel and drive differently without the braking support of the MGU-K. Obviously the loss of the MGU-K also means a significant loss in power and although the mainstream media often quantify this by saying they've lost 160bhp (or in Brundle's case like losing the equivalent of a family size cars power) it also has ramifications to how the power is bought in (ie it doesn't all come in at once but progressively as the throttle is applied). It will also have a marked affect on braking points as the driver will be used to full power/brakes/balance etc, so being around 30kph down on the main straight will change how he has to approach that corner and others.